What in the heck are you thinking? And this is me rucking in Moab. Then there were the questions I asked myself. What made me think I could do this? I wasn’t sure I could stay up all night, much less carry the brick-laden backpack and whatever else I’d have to endure. I questioned by my age and my ability; at times the self-doubt was paralyzing and an impediment to my training. How did I get myself into this situation? Upon reflection, there were several compelling reasons why I committed to this and why I will continue to seek future adventures and challenges. The first was ego, pure and simple. When you’re 55 with hip problems and lingering self-esteem issues from high school – and some young(er) male athletes ask you to sign up because they somehow think you can hang with them – you say yes and worry about it later. There is a sense of pride that has come with my new identity as an athlete, and the mere notion that this challenge was within my reach brought with it a feeling of accomplishment. The second was the opportunity to be a part of a team. 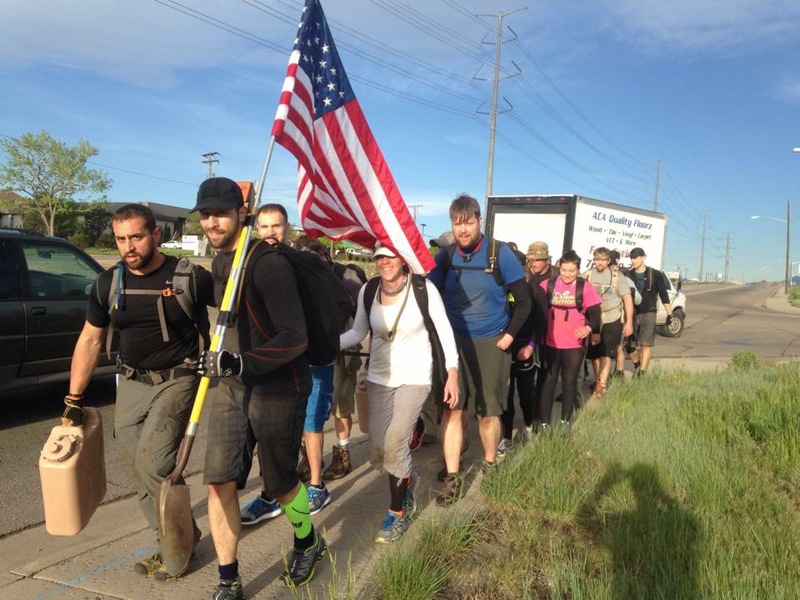 The last reason I signed up for the GoRuck challenge was honor. 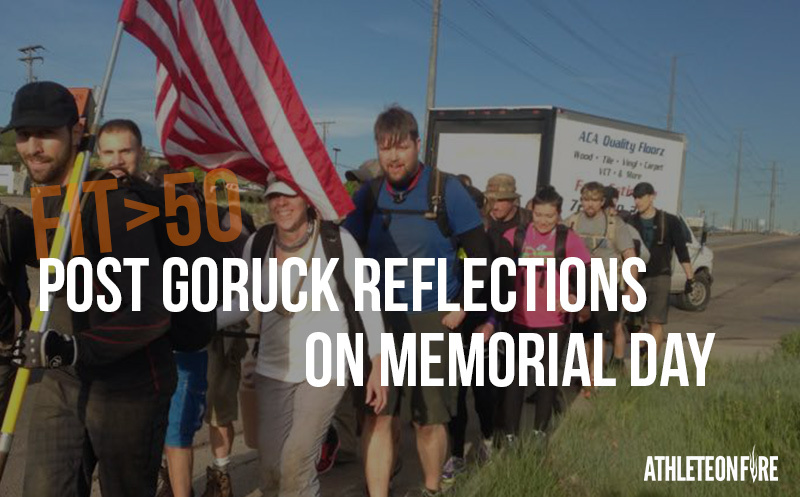 GoRuck is run by members of our US Special Forces and taking one night to experience just a taste of what our men and women in uniform go through to protect our freedom was an honor; I am forever in their debt. I approach any event I enter the same way. I do it in honor of my friend who can’t run, or to honor the sacrifices others have made in my behalf; it is my way of expressing gratitude. Fittingly, that’s me with the flag draped over my head about 12 hours into the challenge. Ultimately, we exercise and train to get in shape. We strive to be thinner, leaner, healthier; we do it to be able to enjoy our lives as we age. Training with a purpose, though, adds a dimension that will help anyone reach a new level of fitness in a way that just exercising to be healthy cannot. It increases motivation, provides a blueprint for the training experience and offers camaraderie. The feeling of accomplishment that one feels at the conclusion of an event is unparalleled. Best of all, the journey to get there is challenging, fulfilling and just plain fun. My next adventure? I don’t know… I’m thinking Tough Mudder in September with a couple of races along the way to help me prepare. We shall see.. 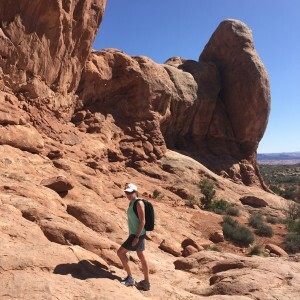 Newer Post BU:09 Becoming Ultra: Some ideas on managing time with life and running. Older Post What a Grateful athlete sounds like.